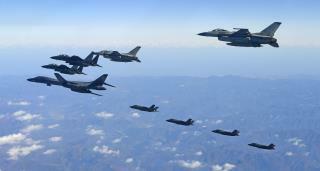 (Newser) – War on the Korean Peninsula is now inevitable thanks to America's "confrontational warmongering remarks," North Korea warned late Wednesday. A statement from the country's foreign ministry said the outbreak of war is an "established" fact and the only remaining question is when it will happen, Reuters reports. "We do not wish for a war but shall not hide from it, and should the US miscalculate our patience and light the fuse for a nuclear war, we will surely make the US dearly pay the consequences with our mighty nuclear force which we have consistently strengthened," the statement said. Tall, ugly, fat Drumpf with the funny hair-do, and short, ugly, fat Kim Jong-un with the funny hair-do, should face each other in a cat fight, or a mud fight, giving away free tickets for the inane show as a Xmas gift. I had a dream someone called in the middle of the night and said we have started carpet bombing NK. I hit record on the DVR and had great night sleep! Trump is stupid enough and selfish enough to make this happen to everyone. He would be proud of it, too.